A lost chapter in Bat-history. For the MARSHALL ROGERS Index of stories and tributes, click here. The late Marshall Rogers was born 68 years ago — Jan. 22, 1950 — and as each birthday passes, I despair a little bit more that his magnificent and influential Batman art appears to become increasingly obscure. Not among people of my generation, mind you. 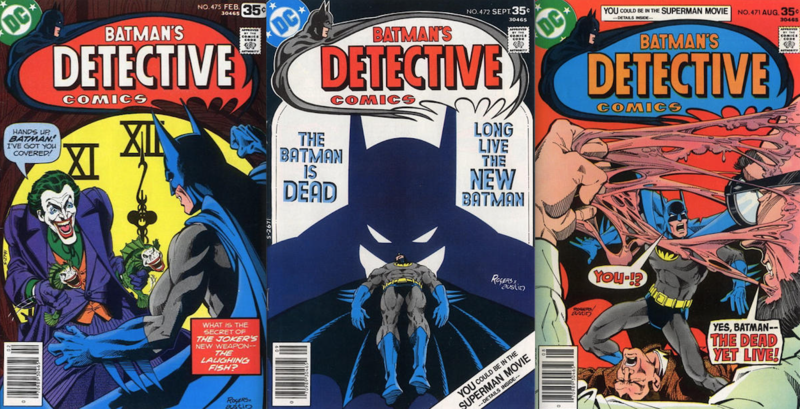 Those of us who grew up in the ’70s and ’80s are acutely aware of just how spectacular the Steve Englehart/Rogers/Terry Austin run in Detective Comics was. 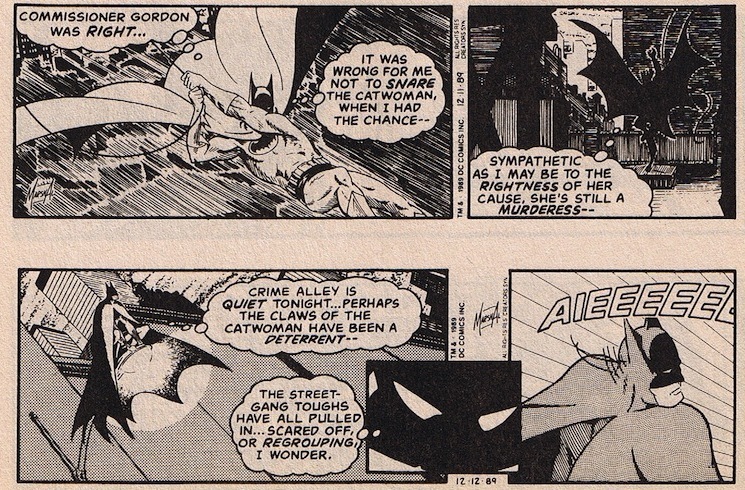 DC Comics should also reprint Rogers’ 1989 Batman newspaper strips written by Max Allan Collins. The Rogers-Collins story is odd and interesting. 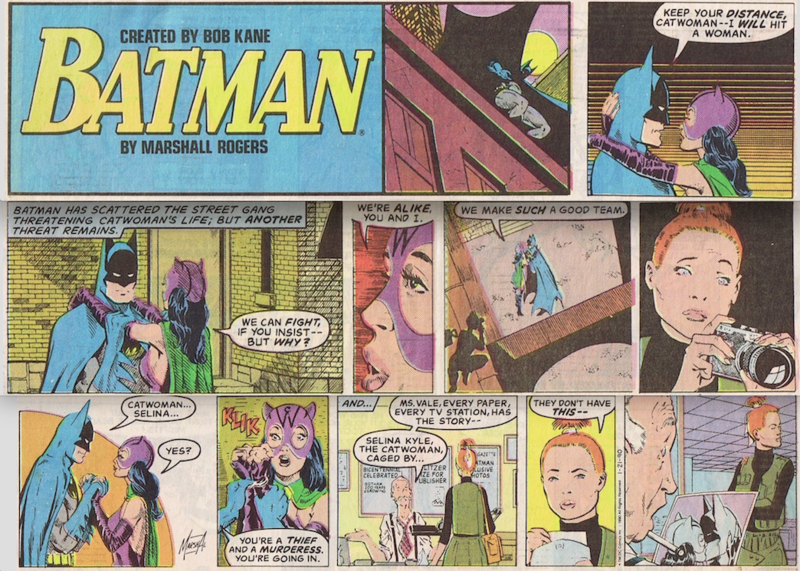 It picks up where the 1989 Batman movie left off but with some important differences: Batman’s wearing his comics costume of the time; the Joker death plunge is instead left ambiguous; and Vicky Vale doesn’t appear to know Bruce Wayne is Batman. John Nyberg joined as inker as the series progressed. It is cool to see Rogers illustrate Catwoman, since he never drew her in costume in the comics. (Correct me if I’m missing something, folks.) That said, her outfit is kind of a bizarre take on her classic Golden Age costume, with asymmetrical boots and an unfortunate “CW” design on her cat cowl. And Rogers himself was kind of a weird choice for the medium. One of his greatest strengths as a storyteller was scope: He drew detailed cityscapes as good as — and perhaps better than — any artist in comics history. 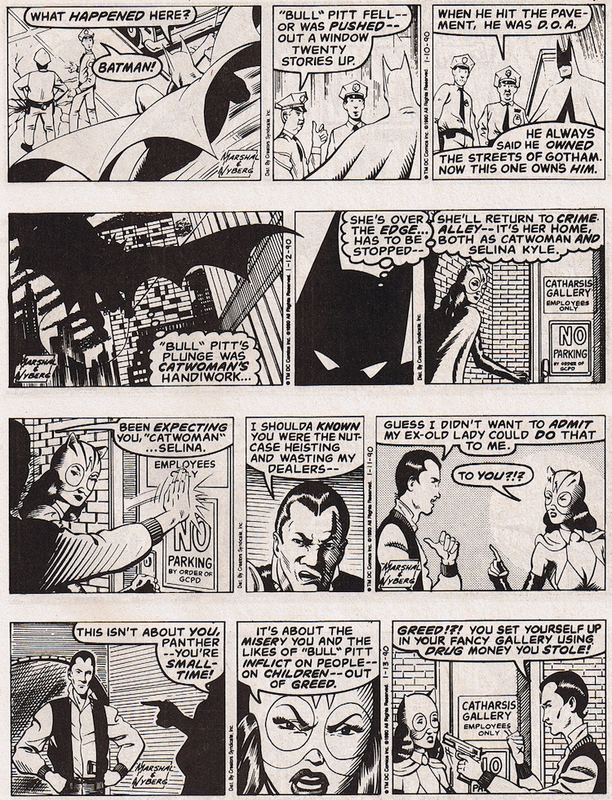 His Batman, with his flowing cape, benefited from the full comics page. His panel breakdowns and ability to lead the reader’s eye, enhanced it. It all makes for an offbeat chapter in both Batman lore and Rogers’ artistic history — but it’s a chapter that demands to be preserved nonetheless. Because Marshall Rogers — who died far, far too young in 2007 at the age of 57 — to this day remains one of Batman’s three or four greatest artists ever. The thing is, DC has an ongoing relationship with IDW’s Library of American Comics imprint to reprint its newspaper strips. Golden Age and Silver Age Batman, Superman and Wonder Woman strips, for example, have been bundled into wonderful, landscape-shaped hardcover editions. But from what I’ve been able to sort out, DC has not made a deal to reprint these later strips — let alone the unrelated, Justice League-starring The World’s Greatest Superheroes newspaper series that ran in various permutations from 1978 to 1984 and ultimately morphed into a Superman vehicle. I can only speculate that there are rights and royalties issues that are complicating things because the people who’ve been putting these editions together love their comics history. (Plus, DC has a robust reprint program in its own right.) And I can’t imagine that a hardcover series that includes Rogers and Collins’ strips — and the subsequent Messner-Loebs/Infantino segments that continued the series — would sell any less than what DC and IDW have been publishing for the past several years. It’s a mystery worthy of the Darknight Detective himself. Unfortunately, the end result is that there’s just one more piece of Marshall Rogers’ legacy that is in danger of fading away. The final strip, a Sunday segment. I would order these reprints today! Yes, DC must reprint these. NOW. Dan, great piece, especially the research into the reprint aspects.. Where were you able to find the color strips? One member of the Back Issue Magazine Facebook Group posts the World’s Greatest Superheroes strip chronologically. They’re pretty bad story wise, but Marshall’s art was still killer. I kick myself everyday for passing on buying the originals from Marshall way back in 1991 for $50 each!! Yes. But not the newspaper strip. And that book is also out of print.